Being faced with hair loss can be extremely upsetting and difficult to accept. Many women decide that they would like to take action against the condition, but it can be hard to know which path to take with regards to treatment. There is a vast amount of products out there that claim to reduce hair loss and stimulate regrowth, but unfortunately, a significant proportion of these are bogus. Below, find some useful information about some of the more successful options. This is probably the most well-known topical treatment for hair loss. It was first designed as a treatment for high blood pressure, but it soon became evident that it has the ability to promote hair growth. This is thought to be due to the increase in blood flow to the scalp, which occurs when the medication dilates blood vessels. It can be bought in the form of lotion or pills, and it usually begins to make changes within around 12 weeks. The drawbacks of this preparation are that any hair that grows is likely to fall out if you stop taking it, and it can take up to a year before its effects are fully noticeable. Lotions containing corticosteroids are often prescribed for treating psoriasis or other problems associated with inflamed skin, but one of the side effects is that they can cause excessive hair growth where applied. Because of this, many women have success when using the medication on their scalp. The negative aspects of these products are that they can cause acne and thinning of the skin. This treatment entails the use of a chemical that is applied weekly to a balding area of the scalp, with a progressively stronger solution. Eventually, the strength of the chemical will be such that it induces a reaction in the skin that causes the growth of new hair. It is said that fewer than 50% of users experience success, but those who do should see the effects after around 12 weeks. It can cause a severe reaction in some people, and any hair that appears is likely to fall out if regular application is stopped. If you feel that these synthetically-developed products are not right for you, or you wish to try a more gentle approach to begin with, there are several natural treatments that many women find to be successful. A particularly favored product is coconut oil. This can be found in many hair products such as shampoos, conditioners, and intensive hair masks, or alternatively, the oil alone can be very beneficial for stimulating hair growth if it is massaged into the scalp. 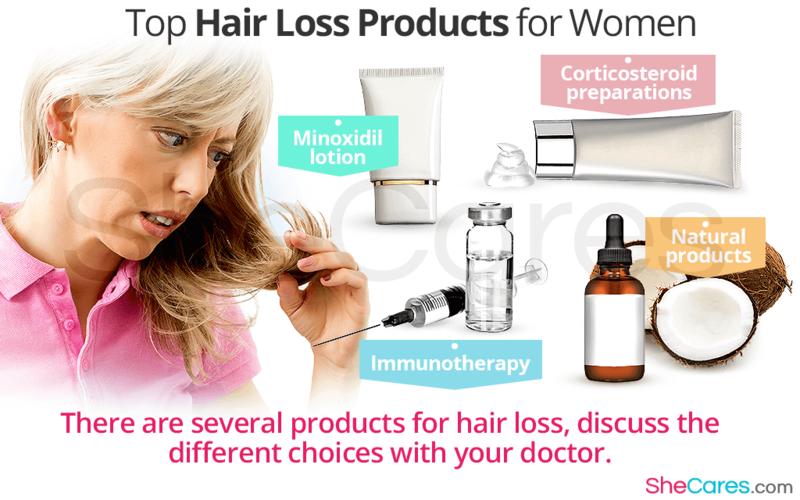 The world of women's hair loss products can be daunting and confusing, but with some knowledge of the available options, it should hopefully be a little easier to find a treatment that works for you. Many products are available in pharmacies over the counter, and remember, you can always discuss the different choices with the pharmacist or your doctor.